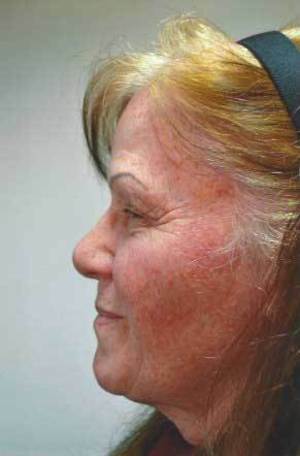 This 66-year-old woman had previously had an occurrence of skin cancer on her face, and she knew that other areas of her face had higher chances of also developing cancer. She had a history of heavy sun exposure and had developed progressive hyperpigmentation over the years, presenting as blotchy skin and dark spots. Additionally, she was bothered by lines and laxity, particularly around her eyes and mouth. She visited our Champaign-Urbana-area clinic for level III laser skin resurfacing with our CO2 laser. This procedure significantly diminishes the likelihood of skin cancers developing in the future while also improving skin color and texture and reducing wrinkles. We performed her procedure here at our outpatient facility in Savoy while she was under general anesthesia. When comparing her before-and-after photos, you can see the improvement in her skin color. It now has a much more uniform tone and texture. 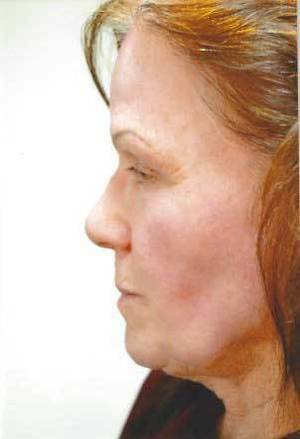 As a result of this procedure, her skin no longer appears dull and damaged. It's now smooth and vibrant, giving her a more youthful appearance. The patient says that, after losing a portion of her upper lip to skin cancer years previously, she had been continuously worried about when "the next lesion" would appear on her face. Having had laser resurfacing, she's happy that it's helped her regain a sense of calm and control that she hasn't felt since before her skin cancer diagnosis. She is grateful for the stress relief and her healthy appearance.